The expected concentration values of my sample are too high or too low. Which steps are recommended for troubleshooting? Please clean your measurement head and lid with a fluff-free tissue moistened with water or 70% ethanol. To avoid thawing effects make sure, that the sample has reached room temperature and it was mixed accurately before the measurement. We recommend to use purified samples to avoid disturbing signals from impurities that absorb also in the region of interest. Make sure that your pipettes are calibrated and the required tips are used. Please check whether you have selected the correct application (e.g. dsDNA, RNA, oligo) for your sample type. Ensure that the sample volume applied to the instrument correlates to the necessary volume for the selected pathlength (min. 1 µL for dilution 15/0.67 mm pathlength and min. 0.3 µL dilution 140/0.07 mm pathlength). Note, the 0.07 mm pathlength (equivalent to dilution 140) should not be utilized for samples with a concentration of less than 100 ng/µL. Are the concentration results automatically converted or do I need to do additional manual calculations? Within “Nucleic Acids” and “Protein UV” methods as well as in the Concentration, Standard Curve and Protein Assays applications, the concentration values are automatically calculated. The A260 or A280 values are also displayed within these 6 applications. In all other methods, the absorbance values (normalized to 10mm) are provided. Is it necessary to perform a purification protocol for protein samples before protein UV measurements? Yes, absorbance measurements are not specific for a particular type of protein. The presence of other molecules, that also absorb at 280 nm, will influence measurement results (for more information, please see the question below “My samples show high absorbance in the 200-300 nm range; what could be causing this?”). For crude cell extracts it is recommended to perform a colorimetric assay—e.g. Bradford or BCA. Is it necessary to perform a purification protocol for nucleic acid samples before the measurement? Yes, absorbance measurements are not specific for a special type of nucleic acids. The presence of other molecules that absorb also at 260 nm does have an influence on the results. Is it sufficient to clean the surface of the measurement head and the lid with a fluff-free tissue? Yes, it is recommended to clean the measurement window surfaces with a fluff-free tissue. If using a sticky or hard to clean sample type, a DI water moistened fluff-free tissue can be used. If needed, 70% ethanol or isopropanol can be utilized for cleaning as well. Are there problems with using solvents or aggressive substances? In general, the surfaces of the measurement head are very resistant. However, it is not recommended to utilize concentrated acids or bases on the instrument. For questions regarding specific solvent compatibility, please contact the Implen support team. A list of compatible solvents can be found in the user manual as well as here. Does the Implen software also work on my Mac? Yes, the Implen software can be operated with Windows and Mac-based computers. Does the NanoPhotometer® require a computer or notebook for operation? 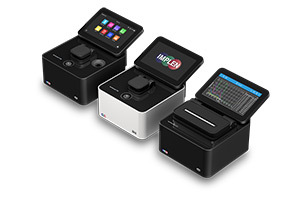 The Implen NanoPhotometer® family is designed with the utmost flexibility. It can be either purchased with an integrated display as a stand-alone unit or controlled by a computer via USB. Control via smartphone or tablet is possible as well. What is the ideal storage buffer for my nucleic acid samples? DNA dissolves best at an alkaline pH; it should be stored in an alkaline buffer such as 10 mM Tris-HCl (pH 8.0 – 8.5) including DNase-free water to prevent acid hydrolysis. For long term storage, the addition of 1 mM EDTA is suggested to prevent nuclease activity; alternatively, sodium acetate-alcohol precipitate can be utilized. RNA should be stored under slightly acidic buffered conditions, (pH 4.0 – 5.0) to prevent nucleophilic self-attack. It is best to use fresh RNase-free water for buffer solutions and store at -80 °C. Can I use ultra pure water as a buffer? As the pH of water varies caused by the solvation of CO2 from air, it is not recommended to use (ultra) pure water as buffer alone. Can storing DNA in buffers containing EDTA affect my downstream applications and will it affect my spectroscopic measurements? In order to achieve optimal PCR results, EDTA should not be used in PCR buffers as it is a divalent chelator and will inhibit enzyme activity. Additionally, EDTA absorbs near 230 nm, which influences the 260/230 ratio of samples. My samples show high absorbance in the 200-300 nm range; what could be causing this? – Urea, EDTA, carbohydrates, phenol, Guanidine HCl, as well as peptide bonds, absorb between 200 and 230 nm. – High sample turbidity can be indicated by an absorbance present at 320 nm. What steps are recommended to test for cross-contamination or residue left behind from previous samples? After cleaning the measurement head, apply your blank solution and run it as a sample. If no concentration is detected (flat measurement line at zero) the measurement head is completely clean. If a concentration result is displayed, please repeat the cleaning process. It is recommended to use a tissue moistened with 70% ethanol to properly remove sticky or highly concentrated protein samples. Which cuvettes can be used with the C40 and NP80? A cuvette of any kind (quartz, glass or plastic) from any manufacturer can be utilized. The following pathlength settings can be adjusted: 10, 5, 2, 1 and 0.5 mm. For microvolume cuvettes, a z-height of 8.5 mm is required for compatibility. Is it possible to switch between single and multi-channel mode on the N120? Single channel mode is available in all applications. Multichannel mode is only available in the Nucleic Acid and Protein UV applications where it is set as default. In the parameters selection panel there is a toggle that activates single channel mode. Which sample IDs can be selected and how do I adjust the sample map? Possible sample IDs include Blank (BLK), Control (CTR) and Sample (SPL). From the sample map screen, Sample IDs can be selected by tapping ID above the sample map window, selecting the preferred sample ID and then tapping Set ID. Sample IDs can be edited by selecting a row or column (row or column will appear white), then follow previous steps to set sample ID. How are sample maps imported/exported and which file type is used? A csv file is used for predefined sample maps. Users are able to define sample maps by selecting rows and columns and setting sample IDs. In order to import the sample map from a file directory (e.g. USB Flash Drive, NanoPhotometer®) tap ID, then Import and select the desired sample map. A sample map is exported by predefining a sample map on the NanoPhotometer device, then tapping ID and selecting Export. A designated folder must be selected in order to save the sample map. Is a blank measurement necessary? A blank measurement must be carried out prior to measuring a sample. If the sample map does not contain a blank ID, a blank measurement still needs to be performed and is classified as a “hidden blank”. The blank measurement is not visible in the sample map but appears in the results table. How accurate are the measurements with the Implen NanoPhotometer®? The Implen NanoPhotometer® is performing accurately over the entire lifetime. The two pathlengths 15 and 140 are fixed anchor points and will not alter. The patented Sample Compression Technology™ prevents the sample from evaporation. The deviation per measurements is less than ± 3% – depending on the nature of the sample, etc. How accurate is the reproducibility of the Measurements? Measurements of a single sample without pipetting a fresh sample onto the system allow a maximum deviation of 0.003 Abs (fluctuation of the lamp). Do I have to re-calibrate the Implen NanoPhotometer®? The Implen NanoPhotometer® is maintenance and service free. There is an automatic self-calibration executed with every start-up. How long is the lifetime of the lamp? The Implen NanoPhotometer® works with a Xenon flash lamp. The lifetime of the lamp is approximately 10 years (109 flashes). The lamp does not change intensity over its lifetime. Is the lamp continuously burning if the Implen NanoPhotometer® is switched on? NO. The lamp is only active during measurements (when flashing). There will be no damage to the lamp if you switch on the Implen NanoPhotometer® for the whole day. Does the integrated vortexer influence the performance and optical properties/stability of the Implen NanoPhotometer®? The built-in vortexer is a specially designed low vibration vortexer which has no influence on the performance of the instrument. A standard vortexer which is placed beside the Implen NanoPhotometer® generates more vibrations to the Implen NanoPhotometer® than the integrated low vibration vortexer. Which NanoPhotometer® models are compatible with the CFR21 software? NanoPhotometer® models N120, NP80, N60 and C40 are compatible with the CFR21 software. The N50 and previous generation NanoPhotometer®, NanoPhotometer® P-Class, and Pearl models are not compatible. What does the CFR21 compliancy package contain? The CFR21 package includes the 21 CFR Part 11 compliant software and instrument IQ/OQ. The CFR21 software package provides Role Based Access Control with password protection, electronic signatures, data integrity, security and audit trail functionality. The IQ/OQ package consists of a liquid and/or solid NIST traceable secondary standard depending on the NanoPhotometer® model. All secondary standards include a certificate of compliance. Which types of role-based user accounts are available and how do they differ? There are three roles: Administrator, Power User, and User. An Administrator has full access to all folders, data, audit trail and user accounts with all permissions. The Power User has access to folders and data in their defined group. A User is the most limited role and has access to data in their designated folder and subfolders. Where can I access the audit trail? The audit trail can only be viewed by an Administrator via computer in the Preferences section under CFR21. It is possible to save and print the audit trail from Preferences via computer and directly from the NanoPhotometer®. How can I create a network folder? A unique network folder must be set up for each individual user account. 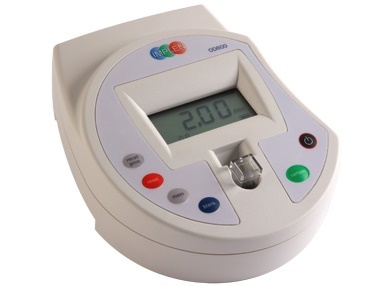 With an Ethernet cable connecting the NanoPhotometer® to a computer, select Preferences, CFR21. After selecting the specified user under Accounts, select Network Folder. The Network Path is set up as follows: //IP/share/path. The IP address can be found in the Network Settings. The user must enter their Windows/Mac user name and password and click on the disk icon to save the settings. The Network Status will change to connected. How can I see where my data is being saved? When selecting the file destination for saving data, the file directory is displayed at the top of the right window. Yes, passwords can be changed in Preferences. Select CFR21, Accounts, select the desired Login Name. Here you are able to enter a new login password. Where can I find data that was not saved? All measurement data is automatically saved in the Autosave folder for 10 days. After 10 days, files in the Autosave folder are not deleted, they are moved to an Autosave Archive folder. Autosave files will never be automatically deleted from the Autosave Archive folder; they remain in the Archive folder until a manual backup or deletion is performed. Only an Administrator has access to the Autosave/Autosave Archive folders. Am I able to change the order of the folders in stored results and stored methods? The folders appear in alphabetical order independent of the user account rights. Where can I access results on my computer via Ethernet? To access the directory of the NanoPhotometer® from a Windows computer via LAN enter the serial number or IP (\\Serial Number or \\IP Address) of the NanoPhotometer® in the Windows File Explorer and confirm with the enter key. For Mac OS X open the “Connect to Server” dialog in the “Go” menu of the Mac OS X Finder. Enter the instrument serial number or the active NanoPhotometer® IP address in the server address field to connect. User access to folders is restricted based upon assigned user rights. The folders are password protected and you will need to enter your NanoPhotometer® login name and password in order to access the folder. Is the CFR21 software a closed or open system? The CFR21 software is designed as a closed system. Closed system means an environment in which system access is controlled by persons who are responsible for the content of electronic records that are on the system. Please clean your Submicroliter Cell and lid with a fluff-free tissue moistened with water or 70% ethanol. To avoid thawing effects make sure, that the sample has reached room temperature and it was mixed accurately before the measurement. We recommend to use purified samples to avoid disturbing signals from impurities that absorb also in the region of interest. Make sure that your pipettes are calibrated and the required tips are used. Please check whether you adjusted the correct application (e.g. dsDNA, RNA, oligo) for your type of sample. Please check whether the lid factor correlates with the lid and that the dilution factor has the required value (default 1.000). Review that you are working in the correct concentration range for your used lid and that the sample volume correlates to the defined amount (see average detection range sheets). Which one of the lids should I use if I do not know the concentration of the sample? This is depending on your sample, if the concentration is below 200ng/µL in general, you start with lid 10. For higher ranges always start with lid 50 as this is covering the widest detection range. Please find the concentration ranges for each dilution lid on the application sheet: “Average detection range and required sample volume”. If the concentration is not in the detection range for the used lid a warning message will appear which indicates “Abs too high” or “Abs too low”. Please check the NanoPhotometer® User Manual for a detailed explanation of the messages. Why does the instrument not show me lid warning messages? When does it appear? Your instrument may operate with an older software version. Please perform a software update with the latest version. You can download this version from our downloads page. Your NanoPhotometer® recognizes when the concentration of the sample is too high or too low for the actual lid. You can now decide if you like to switch to a more optimal lid or continue with the actual one. Do not hesitate to contact our support team, if assistance is required. Are the results automatically converted or do I have to multiply them with the lid factor? Within “NanoVolume Applications” and “Cuvette Applications” the values are automatically calculated. In all other methods, the path length is only documented, but not calculated. You have to process the data by yourself. Yes. Absorbance measurements are not specific for a special type of nucleic acids. The presence of other molecules that absorb also at 260 nm does have an influence on the results. Is it sufficient to clean the surface of the Submicroliter Cell and the lid with a fluff-free tissue? YES. The scratch-resistant quartz surface avoids substances to stick on the cell or onto the mirror of the lid. We recommend cleaning the cell with a slightly wet fluff-free tissue to avoid fluffs on the quartz surfaces. In general, the Submicroliter Cell and the lids are very resistant. However, we do not recommend using concentrated acids or bases. For specific solvents, please contact the Implen support team (support@implen.de) to check the compatibility with our technology. Download the latest list of compatible solvents. Does the PVC software also work on my Mac? No. The PVC software can only be operated with Windows based PCs. I purchased the NanoPhotometer® P-Class with PVC software. Where can I find the access code for my instrument? The access code can be found at the inside of the Implen binder or on the backside of the instrument. The NanoPhotometer® is designed as a stand-alone unit. However, there is the possibility to transfer the data via USB, Bluetooth or SD RAM card to a computer. The software and the accessories can be purchased optionally. Are the latest Software versions compatible with all previous NanoPhotometer® versions? How accurate are the measurements with the NanoPhotometer®? The NanoPhotometer® is performing accurately over the entire lifetime as there are no moving parts that could influence the performance of the product. The patented Sample Compression Technology™ prevents the sample from evaporation. The deviation per measurements is less than ± 5% – depending on the nature of the sample, etc. Measurements of a single sample without pipetting a fresh sample onto the system allow a maximum deviation of 0.005 Abs (fluctuation of the lamp). Do I have to re-calibrate the NanoPhotometer®? The NanoPhotometer® is maintenance and service free. There is an automatic self-calibration executed with every start-up. The NanoPhotometer® works with a Xenon flash lamp. The lifetime of the lamp is approximately 10 years (109 flashes). The lamp does not change intensity over its lifetime. Is the lamp continuously burning if the NanoPhotometer® is switched on? NO. The lamp is only active during measurements (when flashing). There will be no damage to the lamp, if you switch on the NanoPhotometer® for the whole day. Does the integrated vortexer influence the performance and optical properties/stability of the NanoPhotometer®? The built-in vortexer is a specially designed low vibration vortexer which has no influence on the performance of the instrument. A standard vortexer which is placed beside the NanoPhotometer® generates more vibrations to the NanoPhotometer® than the integrated low vibration vortexer. What is the correct orientation of the DiluCell™ cuvettes in the OD600? The light path of the OD600 DiluPhotometer™ passes the cuvette in the up/down direction at a center height of 8.5mm. What volume is required to use the DiluCell™ cuvettes? DiluCell™ 10 requires a volume of 200µL. DiluCell™ 20 a volume of 100µL. Why am I getting fluctuating values with the DiluCell™? First, check for air bubbles in the DiluCell™ and if the necessary correct pipetting technique to avoid bubbles. Also, ensure the DiluCell™ has a tight fit in the cuvette holder. If the DiluCell™ is free to wiggle, the tilted orientation may cause reflections that affect absorbance readings. Can I use DiluCell™ for other applications other than OD600? YES, DiluCell™ can be used in a variety of applications from 340-1100 nm. Implen has approved use of the DiluCell™ with the OD600 DiluPhotometer. Please contact Implen for advice on extending other applications to include DiluCell™ for increasing throughput and decreasing errors.